Cylinders: 3.2L V6 24V MPFI DOHC - 6 cyl. On sale now! This vehicle was originally listed at $31973. We've marked it down to $29960. You save $2013. This 2017 Jeep Cherokee is for sale today in Edmonton. When the freedom to explore arrives alongside exceptional value, the world opens up to offer endless opportunities. This is what you can expect with the Jeep Cherokee. With an exceptionally smooth ride and an award-winning interior, the Cherokee can take you anywhere in comfort and style. Experience adventure and discover new territories with the unique and authentically crafted Jeep Cherokee, a major player in Canada's best-selling SUV brand. This low mileage SUV has just 21700 kms. It's deep cherry red crystal pearl in colour. It has an automatic transmission and is powered by a 3.2L V6 24V MPFI DOHC engine. This vehicle has been upgraded with the following features: Leather Seats, Bluetooth, Rear View Camera, Remote Start, Heated Seats, Heated Steering Wheel. It has some remaining factory warranty for added peace of mind. To view the original window sticker for this vehicle view this http://www.chrysler.com/hostd/windowsticker/getWindowStickerPdf.do?vin=1C4PJMDS6HW653908. Buy this vehicle now for the lowest bi-weekly payment of $195.65 with $3229 down for 84 months @ 5.99% APR O.A.C. ( taxes included, $790 Administration and Secure Ride included / Total cost of borrowing $6550 ). See dealer for details. 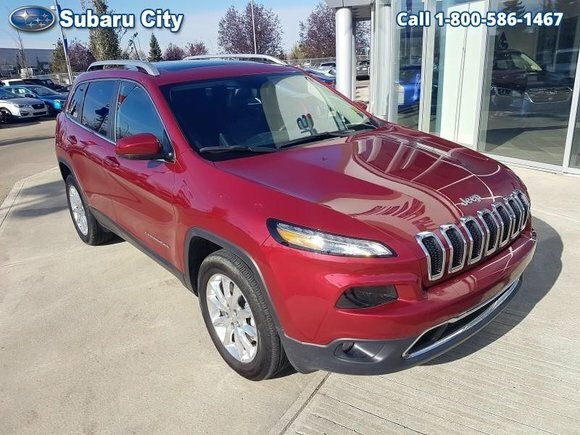 Want to try the 2017 Jeep Cherokee Limited?